Despite the hubbub that the holidays bring, December 2016 was a pretty good blogging month for me. I thought my page views would go down because December is a time for a gift shopping, spending time with loved ones, & celebrating the holidays & new year. It's a busy time for most people, including my readers. 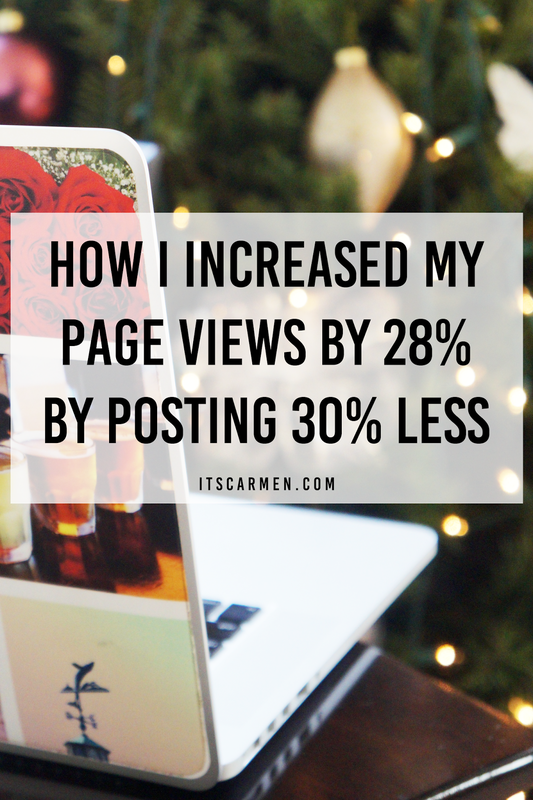 However, compared to November 2016, I increased my page views by 28% even though I posted 30% less. Here's how I did it: I started posting less & promoting more. Whether it's taking photos, curating a collage, writing a post, editing photos or text, finalizing campaign details with brands, or brainstorming ideas, creating blog posts is time-consuming. Rather than post three times per week, I averaged two posts per week in December. With the time I saved from not working on a post, I had the opportunity to promote my posts more. I started off engaging more in Facebook & Google groups (liking & commenting on updates), then began sharing my own posts. My posts received exposure & direct link clicks, giving my blog more page views. I scheduled 3-4 tweets per blog post to go out over the course of the month. I did this with both new posts & previous posts. Scheduling these tweets throughout the month at various times of the day helped me get page views as well as more Twitter followers & engagement. Rather than posting more, I was able to focus on the quality of the post. Is it something my readers can find value in? Are the photos clear & beautiful? Is the content interesting? Am I posting just to post or because I have something to say? The amount time spent tweaking & promoting older posts was approximately equal to the amount of time it would've taken to create a post from start to finish. I spent my time optimizing posts in order to create increased page views, engagement, & sponsored posts, a method I will keep in mind in the future. Was this helpful to you? How do you increase your page views? Nice post ... Very Informative and educative. I need something like this and its coming at the right time. Thanks girl.. Happy new year you. These are such a great tips. Thank you for sharing. And Happy New Year. Thanks for sharing these awesome tips! Creating new blog posts can definitely take up a ton of time. And it's difficult to always promote them when creating new content. I think that promoting existing ones really would help, like you said. It wouldn't work to keep creating new content if no one knows about it. Thanks for this! It's really helpful and I'm going to try and do this for the new year. love these ideas! definitely coming in handy this year! thanks! Great post and thank you for sharing your blogging guides! Such a helpful post, i'm definitely going to try some of these!! Thanks for sharing! This is such a great post! Thank you for all the advice, I must try some of these out! Very helpful! I've recently moved my blog to a new platform and am slowly updating and reacquainting myself with old posts that I can share again. Great tips!! I will try them! I started promoting my blog last summer and it made a huge difference to my page views! I must also try to improve my photography but this dull weather is not working for me. I totally agree on focusing on creating quality posts. Ever since I started doing it rather than keep up with at least 3 posts a week my pageviews increased. Especially when I wrote how to spot fake kylie lip kits when Kylie Cosmetics was barely new yet knock offs was already starting to appear online and on local Asian markets. My views increased 150% and got mentioned by sites like Buzzfeed. But the down side is a lot of people has been copying my posts. Some even word by word, including my photos :( Anyway, what groups did you join in Google? I completely agree with you on this one, hon. Quantity isn't everything sometimes & proper promotion and engagement + time spent making your older work better is more than valuable. I've only posted 4 blog posts in December (I know, sounds awful) because I was away most of the month and then there's work, of course. When I travel, I want to enjoy every moment and not sit glued to my laptop screen, hence lack of posts. BUT! I hit the most page views I've EVER had. I do love writing and plan on posting more (because I love it and I want to produce more content, not because I have to). What groups did you find helpful on Google? Keep up great work, babe! I love these tips! I'm graduating from high school soon, and school takes up a lot of my time, which means I'm barely able to get more than one post up per week. I absolutely agree that quality is extremely important, which is why I only post so little, but I think it's definitely the right way to do it, instead of posting lots of bad quality posts. This is really clever, I've recently changed up my blog design and with it comes a lot of back-end work. I'm planning to go back and optimise all of my old posts and hopefully promote them all as well! Great post! Esp the point to optimize previous posts! Thanks for sharing! I am glad that you wrote this! I have often heard that posting more would increase views but I always felt that focusing on quality posts helps more. Thanks for the other tips especially engaging more on Google communities. This is a great post!! I really need to spend more time promoting my posts and optimizing the ones I already have. Thank you for the tips, I really want to put them to work now and see if I can get some traction :) happy new year babe! Thanks for this! I almost give up my blog. I only earn less than a dollar a day.. i will now focus on promoting and quality of my post. This is some great information since I'm having some difficulty on my blog! I'm going to have to utilize these methods so I can hopefully boost my blog views!